It was exciting to finally launch my new line of jewelry last month! (If you missed the news last month, you can see the new webpage here: www.artdornments.com and new Etsy Shop here: www.artdornments.etsy.com) There is also a new Facebook page dedicated just to ARTdornments, at www.facebook.com/ARTdornments I'd LOVE to have you come over and "Like" the Facebook page, and let me know if you have any particular images, bird species, or themes that you'd like to see created in this new style! There are two beautiful new one-of-a-kind necklace & earring sets in my latest line of jewelry this month. 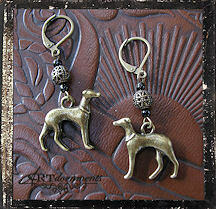 One features an image of a Victorian lady with two greyhounds, set in antique gold. 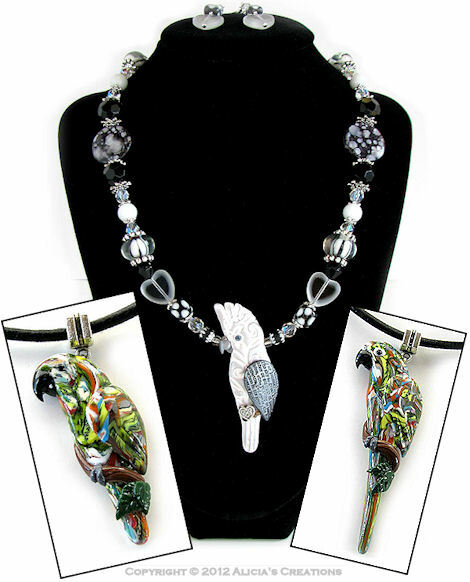 The other set features a Congo Grey, in antique silver. 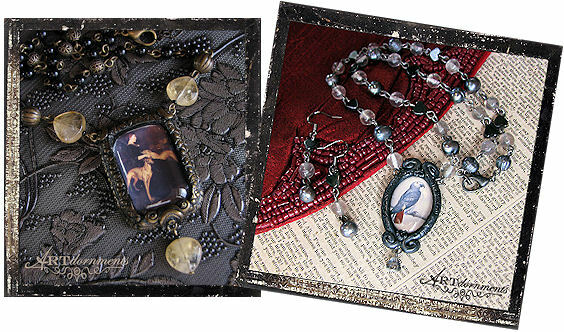 Both necklaces have hand sculpted frames, and are beaded with semi-precious stones. Please see the auction listings to view the pieces more clearly, as there are many details that need to be seen enlarged to appreciate! Both sets are being auctioned on eBay for the next five days. The charm earrings that I offered last month seemed to be popular, so I've made a few more (not shown here) as well as this new set of wonderful greyhound earrings! Check out my auctions to see all of the earrings available on eBay this week. I hope this finds you all well, and to those of you in the hurricane affected areas, please know that you are in my thoughts! My heart goes out to those of you that have had damage and loss. A portion of the proceeds of this month's sales will be donated to the Red Cross to benefit those devastated by Sandy. The Bird of the Month for November is the African Grey, and I managed to create a rather large assortment for you, including both Timneh and Congo Greys. 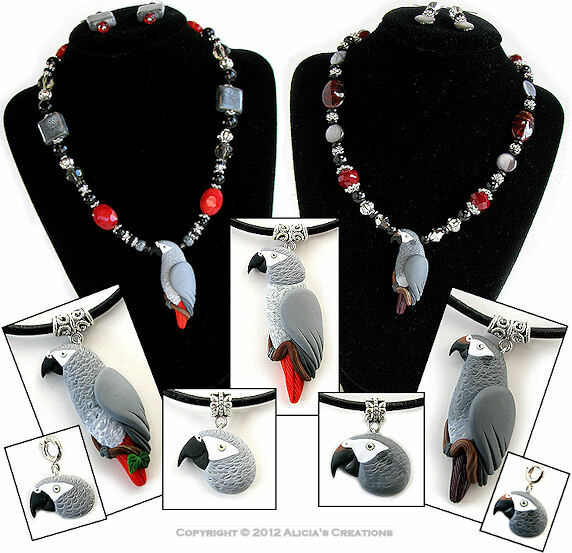 The pieces include: bracelet charms, chokers, pendants, beaded necklace & earrings, as well as an additional Congo Grey pendant that features a "plucked" birdie (shown in the center above). I've had several requests to make a Kawaii styled African Grey - so here you go! I actually made two Grey pendants, one with a tail, and the other is very small and is more of a front view without tail. 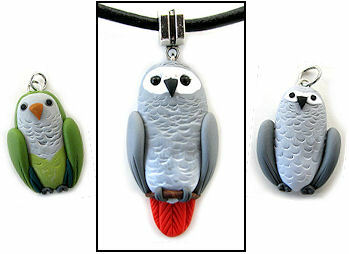 I also made a small Kawaii Green Quaker pendant (shown below). All of this month's pieces are being auctioned on eBay for five days, ending on Monday, November 19th.